Titcomb Basin is perhaps the most spectacular part of the Wind River Range with relatively easy access, the main rival to this being Cirque of the Towers, 30 miles southeast. 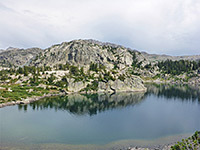 The basin lies amidst a stark expanse of grey granite slopes well above the treeline, and contains several lakes, directly beneath the very steep west face of the mountain crest, which rises to a line of 13,000 foot summits including Mount Woodrow, Doublet Peak, Mount Helen, Mount Sacagawea and Fremont Peak. The upper slopes harbor a few small glaciers, far fewer than the less sunny eastern side of the mountains, but by summer most of the area is free of snow, and there is so much to see that the majority of visitors spend several days here, camping overnight. The path to this remote place is worthwhile in its own right, passing a scenic variety of meadows, woods, valleys, lakes and ponds - and the edge of the basin is 12 miles from the trailhead so just reachable on a long day hike - but for shorter trips there are several good destinations including Photographers Point (4.5 miles; an overlook of a deep valley), Barbara Lake (5.6 miles), Hobbs Lake (6.7 miles) and Seneca Lake (8.8 miles). Although long, the hike is less difficult than might be expected as the few steep sections are quite short, and the overall elevation change is low - Island Lake, at the edge of the basin, is just 1,000 feet higher than the trailhead, at Elkhart Park. The path climbs gradually through thinning forest to Photographers Point then is more undulating, traversing a mix of rocky areas and small woods to Hobbs Lake, followed by descent of a short valley and a steeper climb to the rim of Seneca Lake, the first place where peaks of the mountain crest come properly into view. The next two miles are alongside Seneca Lake and round the prettier Little Seneca Lake, as the scenery becomes steadily more dramatic; the final section to the edge of the basin is over open, rocky meadows through two low passes and down to Island Lake, from where the path continues north to the three Titcomb Lakes, ending at the far side of the basin. Island Lake is the main camping location, as places are very limited beyond; there are also smaller areas beside Seneca and Hobbs lakes. The abundance of ponds and lakes makes this region good for fishing, and the trail is also popular with climbers, en route to the high peaks. Wildflowers are numerous and varied, and animals are relatively abundant, including black bears and sometimes grizzly bears. Topographic map of the route. 38 views along the trail to Titcomb Basin; gallery, slideshow. 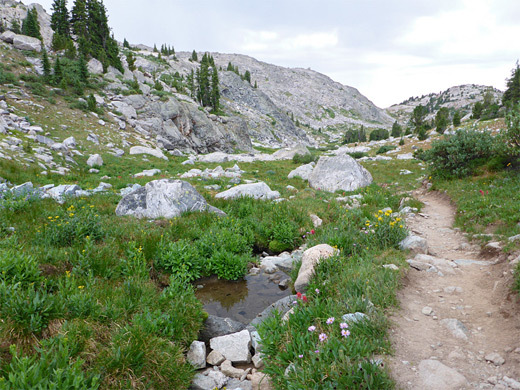 The path to Titcomb Basin, initially the Pole Creek Trail, starts at the meadowland of Elkhart Park (9,340 feet), 14 miles by the fully paved Fremont Lake Road from US 191 in Pinedale. A side track to the east after 8.3 miles gives access to good locations for free primitive camping, this shortly after the turn-off to the developed campground at Half Moon Lake. The lower section of the road crosses open slopes, while the final few miles is through thick pine forest, which opens up occasionally giving fleeting views of distant mountains. The trailhead is served by a large parking area, often busy though not usually full. 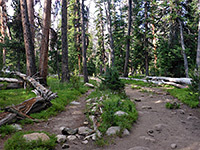 The road ends just beyond at a USFS camping area and a second, less used trailhead for routes to Long Lake and other lower elevation places. 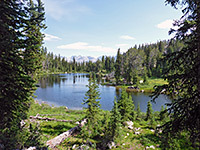 Locations reached from the main trailhead include the Pole Creek Lakes, Lost Lake and the Jean Lakes along Fremont Creek, but Island Lake and Titcomb Basin are the usual destinations. The path starts off through thick, rather gloomy lodgepole pine woodland, curving round a corner then heading uphill along the south side of the shallow valley of Faler Creek, generally staying a little way above the stream, which is visible only occasionally. The ground levels out after a mile, as the trees become shorter and the surroundings somewhat lighter, and a narrow path forks off to the south (after 1.4 miles), signed to Grouse Mountain. 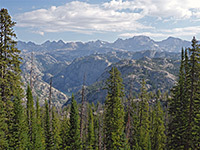 The main trail, signed to Photographers Point, crosses the boundary of the Bridger Wilderness and runs alongside the first significant meadow, which allows views of a much bigger valley away to the north (Fremont Creek) and of the distant summits. Another path branches off southeastwards after 3.2 miles, to Miller Lake and the Sweeney Lakes, by which point the surroundings are markedly less wooded, and the grassy ground is sprinkled with many whitish granite boulders. Photographers Point is reached after 4.5 miles; this is an overlook at the brink of sheer cliffs high above the Fremont Creek valley, and although the views to the north are partly obscured by trees, there is still much to see. There are several small ponds nearby, one right next to the viewpoint. The trail continues through rocky patches and small groups of trees, past another pond and on to the next intersection (5.1 miles), with an alternative route to the Sweeney Lakes, followed by a bigger pool in an open area, and yet another junction (5.8 miles), where the slightly busier path to the Pole Creek Lakes heads of to the southeast. The next section of the route to Titcomb Basin - now the Seneca Lake Trail - is down a short, steep, wooded slope to the first lake, Barbara, then round the western half of the shoreline, and alongside a tiny creek beneath low cliffs to a better, more open viewpoint, of the lands to the north; the mountains already seem significantly closer than at Photographers Point. The path descends a stony ravine and an open slope to the flat floor of a valley containing a small stream, a tributary of Fremont Creek, then continues past a pretty pool bordered by a patch of trees, up a rocky hillside to a pass and down to the larger Hobbs Lake (6.7 miles), which is relatively long but narrow, lined by gentle, mostly grassy slopes. The path is now heading due north, crossing the exit stream just above a pond and leading onwards beneath a line of cliffs, past a ravine containing a creek that flows through a noisy cascade, and another small pond, followed by a slightly longer descent to another pond bordered by a sloping shelf, and then down some more to a small, unnamed lake (8 miles), lined by more nice cliffs. The path turns east and climbs 400 feet up a briefly enclosed ravine followed by more open slopes, and over a rocky brow to the rim of Seneca Lake, the biggest in the region. This is the first point where the mountains are properly in view, and from now on all the surroundings are essentially treeless, the granite slopes sparsely covered only by wildflowers and short grass. The path descends briefly to water level, climbs slightly to pass a cliff-bound section and drops back down to a flat area on the north side of the lake (9.3 miles), a good camping location. A junction soon after is with a northwards path to Lost Lake and Moya Canyon. The main trail rounds a pond and rises slightly to Little Seneca Lake, centered on a picturesque island supporting a few pine trees. Muddy areas along the water's edge are home to several miniature flower species including lesser spearwort and small white violet. 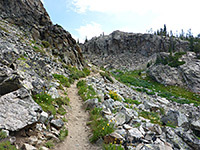 The path follows the west and north shoreline, climbing along a ledge beside an elongated seep that sustains many more wildflowers, then rounds a corner to another junction (10.3 miles), beside a shallow lake; this is with the Highline Trail (also the Continental Divide Trail), which to the south goes to Lester Pass and the Pole Creek Lakes. The Titcomb Basin route (now the Indian Pass Trail) is north, switchbacking steeply up a rocky slope by 200 feet to a pass, followed by a shorter descent into a floral basin, and continuing over grassy and rocky slopes with a few patches of trees to another, less steep saddle. Ahead, the land shelves gently down and a short distance further the low cliffs at either side fade away to reveal a splendid view of Island Lake, at the south edge of the basin, flanked by spectacularly steep and craggy slopes that rise over 3,000 feet to the pointed peaks along the crest (also the continental divide), and surrounded by a vast granite wilderness containing many smaller lakes and ponds. 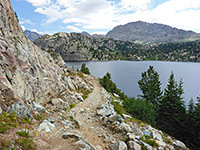 The trail continues down a little more to the south edge of the lake (12 miles) and then reaches the first of the three Titcomb Lakes after 14 miles; the end of the official trail, at the far end of the basin, is another 2.4 miles.